It’s fitting that we spoke to Rhett McLaughlin and Link Neal today of all days. Friday the 13th marks two milestones for the comedy duo: This morning, they celebrated their 1,200th episode of their daily YouTube talk show, Good Mythical Morning. And tonight, they kick off their Tour of Mythicality for their brand-new book, Rhett & Link’s Book of Mythicality: A Field Guide to Curiosity, Creativity & Tomfoolery. For years, Rhett & Link have made a living embodying a mythical life. Seriously, it’s been years: They met on the first day of school in first grade and have been best friends ever since. They’re some of YouTube’s original creators, and now, they’re bringing their comedic sensibilities to print. Rhett & Link’s Book of Mythicality is part memoir, part Mad Magazine issue, and part love letter to their lifelong friendship. It documents some of their greatest childhood adventures and inspires readers to adopt a curious, creative, and mythical mindset. Read on for a smart, silly, and ultimately thoughtful conversation about creative collaboration, the evolution of YouTube, and the power of friendship. 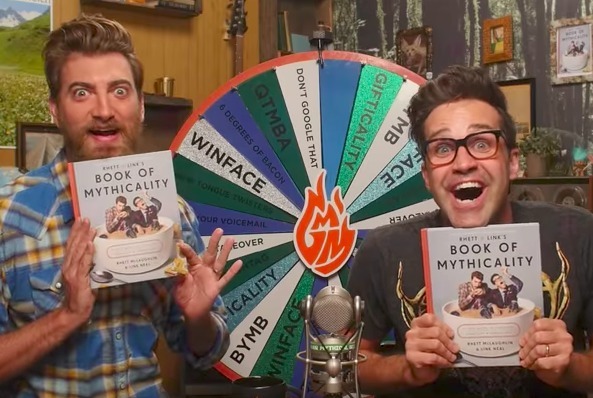 Oh, and how Rhett & Link’s Book of Mythicality can help you incorporate mythicality into your own life! 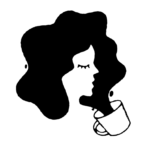 HelloGiggles: So much of your life exists on the internet. It must be nice to hold a physical copy of something you’ve created. Rhett McLaughlin: Yeah. I’ve been touching it a lot. Link Neal: It’s trading 1s and 0s for atoms. RM: Well, I think digital information is also made of atoms. LN: I think it is! RM: If not, what is it? LN: It’s represented by atoms. RM: It’s electrons. It’s a type of particle, but it’s not full atoms. It’s not full molecules. This is definitely molecular. LN: You can palpate it. RM: …about the resurgence of tangible goods. LN: When we first got [our book], I stroked it a lot. It was unintentionally awkward, which defines a lot of my life. HG: How long has this been in the making? RM: Initial conversations were about two years ago. It started very small. It was like, Let’s do a cookbook with some of our Will It? recipes. And then it became much broader than that. We didn’t ever think that it was gonna have any personal stories, but once we started digging in, we just kept putting more and more of ourselves into it. It became a memoir — all this history that we’ve got together. And then translating that to how we’ve incorporated mythicality into our lives. It has a little bit of advice, but not an annoying amount of advice. Not a pretentious amount of advice; just a few steps short of pretentiousness. LN: We’re always flirting with pretentiousness. HG: After college, you both worked 9-5 jobs in engineering. What’s the timeline of quitting your corporate jobs and starting to make videos? Were you doing both at the same time for a while? RM: We did videos on the side for a few years. But it wasn’t until ’07, when we got a job hosting a really bad network television show called Online Nation that was about internet videos, that we officially moved into entertainment full-time. But it was kind of short-lived before we had to turn around and start trying to figure out how to “do” the internet. We thought we were going to be entertainers, not internet-tainers. That was spoiled pretty quickly when the show that we were on was so bad. And then people took some of our internet videos and uploaded them to YouTube without us knowing. Then we got very intentional about uploading YouTube videos. HG: When you started making videos, the concept of being “internet famous” didn’t really exist in the way it does now. Did you ever think you’d end up here? RM: It was not according to any plan. It was very much just, This seems like the next thing to do. And then we would observe how things were changing around us. And then it was like, Ok, we’re doing this for a living. I wonder how long this is gonna last. LN: When we were writing the book, the first phase was telling stories from our past, not knowing what the application was or how it would fit into the book. We started telling the stories that ended up being the Get Lost chapter. We would ride our bikes to a certain secret meeting place [when we were kids], and we would just pick a direction and go until we had to turn around and get back home in time for dinner. Once we started putting that on paper, we realized that we kept doing that. I think that was always our approach. It wasn’t that we didn’t want something to happen; we just embraced the fact that we had to make something happen, so we needed to do something. We needed to go somewhere. When you get offered a job to host a potentially crappy television show, you just go for it. That was a dead end pretty quickly. But then, the direction after that was, Alright, all we have is our YouTube channel. So we’re gonna make stuff that we want to make. We’re gonna get on our bikes and go this way. RM: We didn’t know who to talk to. LN: We didn’t know the destination. The destination actually didn’t exist. When we were first making videos, there was no YouTube. But then, even when there was YouTube, there was no partner program. There was no one else saying, This is how you make money. So we had to figure that out. There wasn’t a destination, it was just, We’re gonna go. Which is scary when you already have kids. We each had a kid at the time already. There was a sense of desperation. Have you ever seen a kid pedaling his bike down the road? And you’re like, That kid’s got a sense of desperation? That’s always been us. HG: As kids, you made a blood oath pact to create something together. Do you think there’s an alternate universe where you stayed working at your engineering jobs, or was creating something always inevitable? RM: Well, according to multiverse theory, there’s definitely a version of us still at our jobs. There’s actually a version of us that, because of this conversation, gets the idea to go back to our old jobs — Link goes to IBM and I go to Black & Veatch — and we’re like, We were in this interview, and we were asked about the potential of going back to our old jobs, and we did it. Here we are! LN: We picked two directions and went. RM: Reacquaint me to how this engineering stuff works. LN: It’s a good question. We thought that question was so good, we made it the premise of Buddy System Season 2 [their YouTube Red series]. That’s the question we answer in the show. Well, technically the question is, What if we never met? But in episode one, that question is answered. We’re each working, doing whatever we would do if we didn’t know each other. HG: You don’t make content just for the sake of making it. Even when it’s silly, it’s still thoughtful and purposeful. What do you hope that people get out of the book? RM: …the fact that mathematics exists in the universe, whether you’re there or not. But then once you observe it and define it and begin speaking that language, you’re like, Oh, now I can explain this to myself and to other people. These principles of mythicality are things that have always been true about our lives and the things that we’ve been doing. We don’t take ourselves too seriously. We want to contribute those qualities to people’s lives when they consume our content. LN: I think what he’s saying is our comedy is like math. It can help explain a lot of things, but it’s pretty boring. RM: I would say the exact opposite. Our comedy can’t explain nearly as much as math, but it’s a lot less boring than math. LN: Our comedy is better than math. RM: It’s actually not anywhere near as significant as math on a universal level. If our content wasn’t present, the universe would not fall apart and disintegrate in the same way that it would if math weren’t there. Just a mathematical universe would be pretty boring. Remember that book about the two-dimensional world that we all had to read? With circles and squares that were existing in two dimensions? RM: We had to read it! LN: I didn’t read it. RM: I’m gonna look this up, because it’s gonna drive me nuts. LN: What if math disintegrated? What literally would happen? We’re talking the laws of nature. It’s an abstract concept — a way to describe how things are. LN: If it wasn’t how things are all of a sudden, we would be obliterated. RM: Well, nothing would be obliterated, because obliteration would need math in order to take place. RM: No, it wouldn’t do anything. LN: Would it just…[snaps fingers]? RM: You’re asking a paradoxical question that cannot be asked. RM: That cannot be answered. Math cannot go away. If math goes away, there would be nothing. Everything would just cease to exist. RM: So it wouldn’t melt. Because “melt” would be a mathematical principle. HG: You collaborate on lots of different types of projects together: the book, your YouTube talk show, your podcast. What was writing the book together like? LN: He’s John Green’s brother. RM: John Green does not acknowledge Jake. RM: But we do. Jake and the two of us sat down and started having a lot of conversations. We told a lot of stories about our past. He recorded those and went through them and said, You guys touched on these things. So then we developed some chapter headings, and then we would take those stories and write the chapter referencing those stories. LN: It was important for us to actually write our book. RM: [Green] helped guide the process. That was for the text of the book — the memoir and advice part. We wanted this to be something that felt like a typical Mythical production. We’re not just gonna write a book and have you read it. We also want you to look at things, and experience things, and be able to participate in the book. And also highlight some things that fans have done. So that’s where all these additional pages in the book come. Every single page is uniquely designed and very purposeful. That ended up taking just as long as the writing process. Every little element had to be designed. But the feedback has been really good. LN: A world without liner notes is what we put into our book. When I was a kid, I’d get a CD — or a tape — and I’d pore over the liner notes. RM: I will let you know that there were books when we were children as well. I was reading them. LN: I didn’t need those, because I had liner notes. RM: The way that you think about that is very funny to me. Because you’re like, This is like replacing liner notes. And I’m like, It’s actually just another book in the long tradition of books since the printing press. It’s so weird that you see it that way! But for Link, it’s a world without liner notes. HG: What was your first cassette tape? RM: Weird Al’s Weird Al Yankovic in 3-D.
LN: Weird Al’s Even Worse, which was released after that. Rhett got tapes before me in his life because he had an older brother. RM: I bought that tape. I got tapes from my brother, but that’s the first one I went to the store and bought in person. HG: That’s a big deal. Mine was Shania Twain. LN: You were one of the last people to buy a cassette single. HG: When you’re working together, what makes everything click into place? RM: I’m big-picture, get things off the ground, and new ideas. Link is fine-tuning and landing things. We didn’t really discover that until the second half of our career. I think there were a lot of times where we would sit and work on things together, and things would move very slowly because we’d frustrate each other. He would frustrate me because he wants to take all this time, and I would frustrate him because I want to move on and write the next joke. That still happens — we don’t decide to do a new project and then just split up. We are very much constantly in contact and we work together in the same physical office. But we’ve learned that there are certain strengths that we apply to certain things to move them forward more efficiently. We’ve had to get very efficient in order to actually get all the stuff done that we want to do. LN: Rhett has commitment issues, and I have a lot of neuroses. That’s how we channel our problems. HG: Are you a Will It? Are the two of you a strange and unexpected combination, like you explore on Good Mythical Morning? RM: Ultimately, no. It’s complimentary. As different as we are, in a lot of ways we are strikingly, eerily similar. This has happened multiple times in our lives: I’ll get into a car with somebody that we don’t know, and I’ll have a conversation with them. And then Link will get into the car and have the exact same conversation, down to the same six questions in a row. It’s happened multiple times in our lives. That’s just from growing up together and coming from the same place and being similar. And very rarely am I going to be like, I like this band or I like this movie and he’s going to be like Oh, I don’t. That’s why when we get into finishing something, for the most part it’s not going to be like, We have these very different opinions about what the final product should look like. LN: We’ve basically lived our lives together as some sort of weird comedic duo married couple. We spent a lot of time together when we didn’t live together in high school. But then after that, we lived together until we started living with wives. It was a very healthy decision. HG: In the book, you talk about how your ability to entertain each other motivated you to create things. Does having a partner help you get farther vs going it on your own? RM: Something I’ve been realizing lately is there’s a difference between solo creators and duo creators, or anybody who’s doing a group thing. When it gets to be more than two, it gets difficult to keep everybody on the same page. There are very few groups of three or four that stays together for years. That’s unusual. When you’re just one person, it can be difficult to stay committed to a vision and to stay motivated. When there’s two of you, we have these things that exist because of the two of us, but they exist outside of us. That’s one of the reasons we have shows — we see shows as a product that we can produce together. A lot of individual creators just make videos or vlogs. There’s nothing wrong with that, but I think that it would be much more difficult for us to maintain that. We can say, We have a show that has seasons, it has episode numbers, it comes out at a very specific time. Some of that is based on our personality and our engineering background. But it’s how we can get behind projects. These things exist outside of us. It’s not just us on display for the world; it’s something that we’ve made together. I think that’s another reason we’ve been doing it for so long. HG: Your tenure on YouTube is an excellent case study of how the platform has grown — from parodies and funny music videos to talk shows and YouTube Red series. Where do you think it’s going next? RM: I wish I knew. I think the thing that separates YouTube from everybody else right now — the thing that they have that no one else has — is that it is the place where people upload videos for free and watch videos for free. LN: People can become something with the aid of no one. RM: There’s no one who has any sort of digital strategy that isn’t thinking about YouTube. YouTube is going to be around for a long time as the premier place where if you want to make videos for a living as a personality, you can. It’s about people connecting with a personality. RM: I still think it’s primarily driven by personality. Even shows that are popular, are popular a lot of times because of the personality behind them. I don’t see that phenomenon going away. Wherever it goes, I don’t think it can ever abandon that core identity of being a place for people to connect with somebody who’s making stuff for them to enjoy. HG: Was making videos always your main creative outlet, or did you try other things like improv or standup? RM: We’ve never had any sort of traditional audience or process. It was very much just making videos for our friends to enjoy. The typical route to what we’re doing — we’re only familiar with it now because we have people working for us who have taken that more traditional route. You went to film school? You actually studied this stuff? You went through the ranks of UCB? That’s stuff we understand now, but stuff that we never participated in. HG: What do you do on days when you don’t feel mythical? How do you pull yourself out of a non-mythical funk? LN: …but I’m glad that other people do. RM: We get so busy, especially during the week. It’s not like, I don’t feel like doing this today. It used to be when it was just the two of us, but those days are long ended. LN: You can’t run away from what you have to do. RM: It’s like, There’s all these people who are depending on us to do these seven things today. That’s pretty much what every day has become. So it ends up being the weekend for me. I have a routine: On Saturday morning I go out in my backyard, I put the yoga mat down, and I play Apple Spa Radio very loudly. And I have a series of stretches and yoga moves, and I’m out there for like…I probably get an hour before I begin to feel a little bit guilty that I have kids that I need to be parenting and hanging out with. I need that pretty much every weekend. I’d like to get it during the week, but I have not yet found the time. [to Link] Unless you wouldn’t mind me doing that in the office. I play that Spa Radio really loud though. It’s kinda hit or miss, honestly. LN: Are you still answering the question? Want to be your mythical best? Rhett & Link’s Book of Mythicality is now available everywhere books are sold!